This board is super fun. I demoed this board last spring and it was a blast. It is true to what the description says for it. It is soft but not too soft, stiff but not too stiff. I did not feel like I was on a noodle, but It was not too stiff that I felt like I have a thick plank of wood on my feet. It was responsive, poppy and fun. spins around nicely and easily. I was stoked on this board before I tried it and I am blown away again by k2. Really taking women's snowboarding serious. I have tiny feet 6.5, small bindings and with my little feet I still got great response on this board. Testers thought that this board was fun all over the mountain, and intermediate riders felt like it would help them advance their park skills. The twin shape medium flex made it more versatile than a lot of the other park boards: stiff enough to handle larger features and some freeriding, but soft enough to still handle jibbing. One tester commented, “I never ride pipe, but I aired out of the pipe with this board. It was really easy to use the board for turning, jumping, and going through the park.” Adding to the fun factor in the park, it was super poppy, and easy to spin. Negatives? Like most boards we tested, it can’t handle everything - it got lower ratings in edge hold, and felt especially shaky on steep icy terrain. i just got this board cause i ride an indoor slope every thursday night for freestyle nights, so it is ideal. gave it my first test last week and it was sooooooo much fun! and very forgiving which is always a plus! 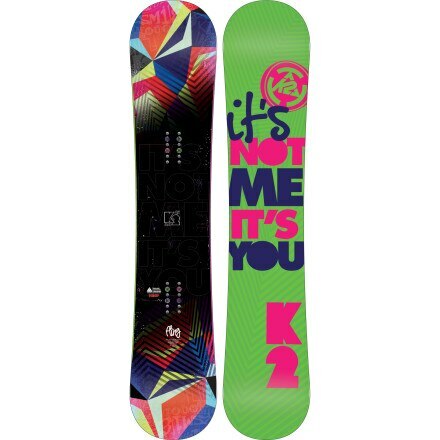 No K2 Fling snowboards were found on eBay at this time.